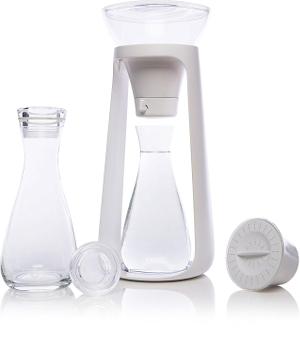 Desperately looking for a glass water filter pitcher? Finding a glass pitcher with a water filter is not easy. It seems as if most water filter pitchers are made from BPA-free material and a few of stainless steel. Health minded people and parents with small children keep looking for glass jugs as they do not really trust the advertising that suggests BPA-free automatically means healthier. Some time ago the Brita Edition Premium Glass Water Filter Jug was available in the UK, but as far as I know never in the US. Although customers all seemed to be happy to have a glass versus a plastic container for their filtered water, some complained about rusting metal parts and a too delicate design for a glass pitcher. Continuing my search for a glass pitcher with a filter, I only found two options available at the moment and both are beautiful designer items in the upper price range. The Water Fall by KOR, a set of filter and two glass carafes, is indeed a great looking item. The size is just right to fit under most kitchen counter cabinets (16.5” tall by 7" wide). The filter made from coconut shells lasts up to 80 gallons (about 4 months). That is noticeable longer than the average pitcher filter can deliver. A big plus is the NSF 42 certification they try to get at the moment, that gives just a little bit more confidence in the claims of contaminant removal. Intended to use with tap water this filter removes chlorine, chloramines, bad taste and odors. If you want additional glass carafes, they are available separately. But remember, you get two with the filter for a start already. The reservoir holds 4 cups of unfiltered water, the same amount as the carafes. That makes it really easy to use. You just need to fill the reservoir once and place the carafe under it. No refilling the reservoir while you wait for one carafe to fill up. Stand and filter housing are made from BPA-free ABS and SAN. An environmentally slightly better choice might be the Soma filter. This filter made from coconut shells, silk and plant parts is completely biodegradable. Everyone's taste is different, but I like the hourglass shape of the glass jug with filter. It is easy to hold and handle, fits into the fridge and looks great on the kitchen counter or table. The German design is shatter resistant and it holds 6 glasses of water. The filter can clean about 40 gallons of water before it needs to be replaced. The Soma filter is certified to NSF standards 53 and 42 backing up the companies claims to remove Mercury, Chlorine, taste and odor, Zinc, and Copper. 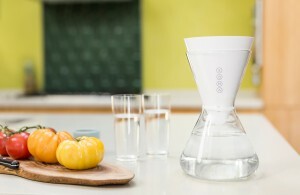 Soma carafe including filters is available online. Please send me an email if you know of any other glass pitchers with filter.